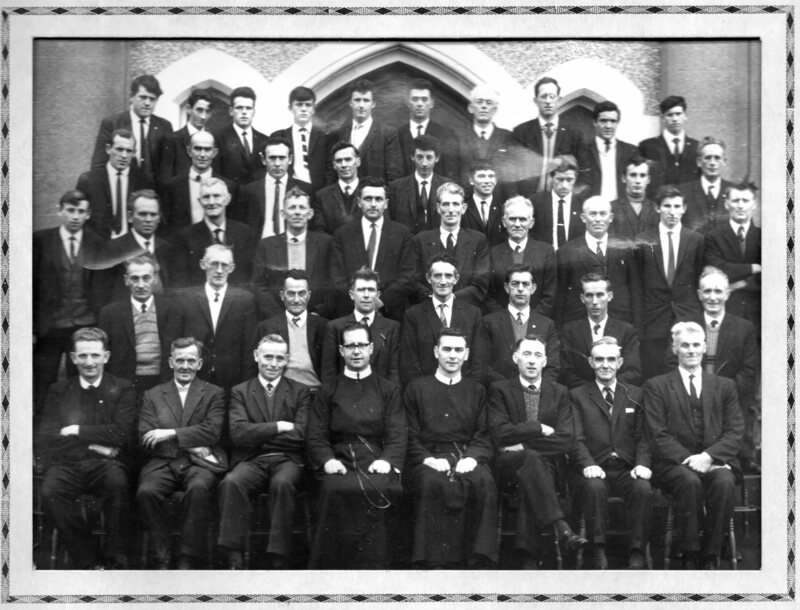 In November 1968 a group of over 40 men from the Parish of Ballinakill, Co Galway attended an enclosed retreat in the Redemptorist Perpetual Help House at Cluain Mhuire in Galway city. Cluain Mhuire is now part of GMIT. There they joined another group of parishioners from the parish of Abbey-Duniry for the week-end retreat. The photograph below was taken at the end of the retreat with the two Redemptorist priests who had conducted the week-end’s retreat. Many of these men are still very active in the parish of Ballinakill in 2017 and we remember those who are no longer with us. Back Row left to right: Liam Hayes; Colm Dervan; Kevin Rourke; Seán Hayes; Seán McDonagh; John Conway; Josie Darcy; Michael Mannion; Pat Kelly; Tony Rourke. 4th Row: Joe Dervan; Seán Fahy; Brendan Dixon; Tommy Larkin; Eugene Monaghan; P J Flynn; John Joe Burke; Eamon Daniels; Tony Hayes. 3rd Row: John Finn; Dermot Brehony; Tommy Coen; Tim Hooban; Pat Joe Cleary; Mick Flynn; John Michael Sheil; Jack Slattery; Liam Connaire; Thomas Riordan; 2nd Row: Con O’Connor; Seán Dervan; Pakie Sheil; Thomas Gardiner; Donie Connaire; Seamus Comer; Michael Kenny; Tommy Kelly. Front Row: Michael Rafferty; John Kilcar; Pakie Rafferty; Fr V Kavanagh; Fr E Hoey; Eddie Page; Johnny Farrell; Martin Nevin. Photo courtesy: P J Flynn.